Meredith NH Real Estate, Horse Farm? Meredith NH Dark Horse Farm....This is a very special property that would appeal to horse lovers, gardeners, folks that love privacy and folks that like to go hiking or snowmobiling on groomed trails. This property has over 21 acres of very pretty land with an extensive trail system. 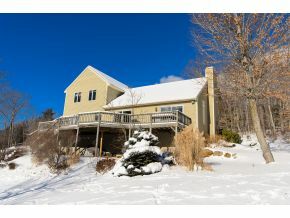 There are mountain views from the over sized deck and the house is surrounded with perennials. There is a turn out from the pasture and a recently built post and beam 36 x 36 barn with a tack room complete with cable, 3 box stalls and a hay loft. The location is not only private, but close to Meredith, 10 minutes to I93 and another 10 minutes to exit 20 and 20 more minutes takes you to Concord. To the North Plymouth is only 15 minutes away. A great location for boaters, horse lovers, skiers or just a lovely respite.